High-speed robotics and highly-automated production and packaging may not be everyone’s cup of tea, but it’s proving to be just the perfect blend of shopfloor brains and brawn for a venerable Quebec coffee producer nowadays finding itself caught up in a fiercely competitive, high-stakes global marketplace. Founded in Montreal in 1919 by a French-born emigrant Albert-Louis Van Houtte as a specialty grocery store, the company quickly sprang to local business prominence as a highly reputed supplier of gourmet, European-style roasted coffee—setting a solid foundation for decades of continuous business growth that made the Van Houtte coffee brand a household name for millions of Canadian coffee aficionados and connoisseurs right across the province of Quebec and throughout much of western Canada. 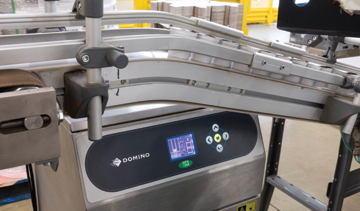 A food-grade FlexLink conveyor whisking a row of single-serve K-Cup packs past a Domino D-Series laser coder below. After a rapid expansion of the company’s bistro business during the 1980s and a well-executed series of strategic acquisitions in 1990s made it one of the country’s elite coffee processors and distributors, Van Houtte entered the 21st Century as a highly prolific, fully-integrated coffee company with a big presence in Quebec’s OCS (office coffee service) segment, a thriving chain of bistro-style cafes throughout Quebec, and a Canadian customer base estimated at over 60,000 offices, cafeterias, grocery and convenience stores, restaurants, hotels and other places of employment. With growing market share and exceptional brand loyalty making it an increasingly attractive investment proposition, the company was ultimately acquired by the Vermont-based Green Mountain Coffee Roasters, Inc. (GMCR) for a staggering $915 million at the end of 2010—setting stage for a healthy inf lux of capital investment from the new owners into Van Houtte’s two production facilities in Montreal, as well as a Toronto-based Timothy’s plant also acquired by GMCR in 2009. “It is a highly competitive global business where you really need to have both product innovation and good process automation to succeed,” says Jean-Francois Vallée, engineering and maintenance director at the central Montreal production facility now operating under the GMCR Canada Group L.P. as GMCR’s CBU (Canadian business unit) manufacturing enterprise. 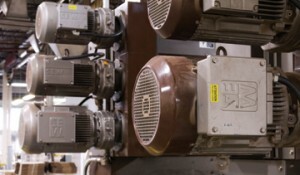 Having joined the Montreal facility in January of 2006, Vallée is mandated with carrying out prime responsibilities for the specification, selection, installation, and integration of all of the plant’s processing, packaging, facility management, HVAC (heating, ventilation and air-conditioning) and other key systems and equipment deployed at the Montreal operations. Naturally, it’s a job that keeps Vallée and his highly-skilled teams of engineering and maintenance technicians busy throughout the year. 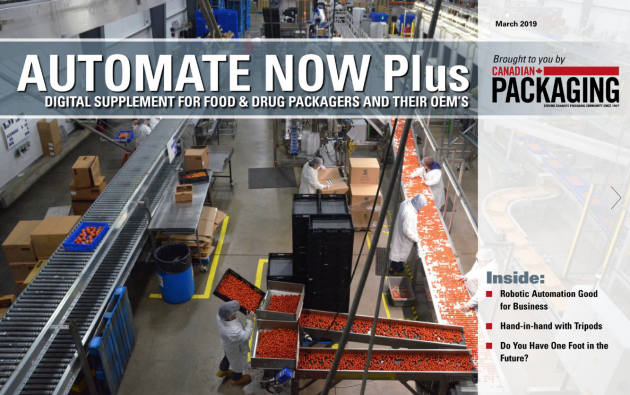 “There’s always something that needs to be done,” says Vallée, who is also mandated to look after the equipment and systems employed at the smaller GMCR’s CBU plant in a nearby St-Laurent suburb, two distribution centers occupying over 140,000 square feet of warehousing space between them, and the administrative offices. A Domino model A220 small-character CIJ printer applies highly legible, multiple text and product code lines onto the round sides of the round plastic K-Cup packs making their way to the case-packing stations. Built in 1992, “this Montreal plant is a fairly big facility that has been already expanded a couple of time since then,” says Vallée, relating how Van Houtte took over the once-shared industrial park complex in four stages to become its sole, but extremely active, tenant. 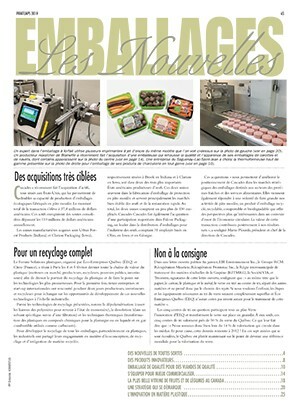 The 115,000-square-foot Montreal facility—currently employing about 350 people (with another 15 at the St-Laurent plant)—has been a grateful beneficiary of an extensive inf lux of cutting-edge, automated packaging and material handling systems to achieve the highest performance and productivity levels possible, according to Vallée. 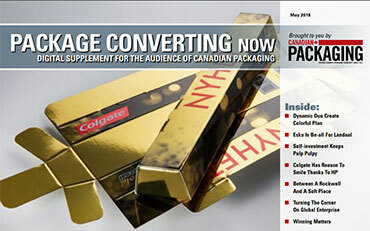 “You simply cannot afford to do jobs like casepacking, palletizing, packaging and just generally moving the stuff around manually any longer,” Vallée told Canadian Packaging in a recent interview. “Now that we are competing on an international stage, optimizing our production line speeds and capacity on ongoing business is essential for us to remain competitive, and GMCR is very proactive in investing in the latest automated processing and packaging technologies to ensure our plant remains competitive well into the future,” says Vallée, citing the plant’s strictly-observed Lean Manufacturing manufacturing regimen and ambitious SQF (Safe Quality Foods) targets and guidelines. 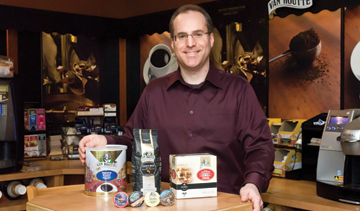 “The Van Houtte name has long been a very popular product brand in both Canada and some areas in the U.S. northeast,” says Vallée, “and joining a company like GMCR, which also owns some of the best-known coffee products and coffee brewer appliance brand names in the U.S. (including Green Mountain, Keurig, Tully’s and Diedrich, as well as Timothy’s in Canada) will certainly help us grow that name recognition right across North America,” Vallée states. “We are playing in the big leagues now, so it is very important for us to stay focused on working to achieve superior product innovation from our research-and-development and marketing people, along with optimal manufacturing performance and top customer service from our logistics operations. A flawlessly-etched permanent product code generated onto a product label by one three Domino scribing lasers employed at the Montreal facility. “It is a tough task and a never-ending challenge, but with the world-class manufacturing capabilities we are acquiring under new ownership, it is a challenge we can definitely rise to,” says Vallée. “We take a lot of pride in what we do and make here in Montreal, and I think that pride really shows in the quality of our final product and the way it is packaged,” he states. 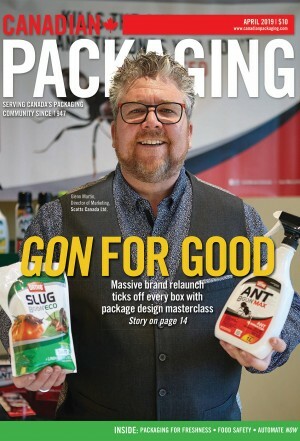 The staggering number of broadly diverse coffee products produced at the plant—approximately 800 stock-keeping units (SKUs), including about 600 ground products—is as a defining testament to the Montreal operation’s product innovation savoir faire as is the comprehensive range of packaging formats used to deliver the products into customers’ hands: including all sorts of bags, pouches, cans and, most notably of late, the single-serve K-Cup packs, which Vallée says are now the fastest-growing segment of the coffee industry. Originally invented in 1990 by Reading, Mass.-based Keurig, now also a wholly-owned GMCR subsidiary, the so-called K-Cup packs—designed for quick brewing of a single cup of coffee, tea, hot chocolate of other hot beverage in single use lidded containers—is all the rage in the North America, Vallée explains, because of the unfolding trend towards quick, on-the-go beverage consumption with convenient, consumer-friendly packaging and a broad choice of coffee varieties, flavors, and roast and blend options. While some companies have since introduced their own single-cup products, Vallée says that having Keurig operated within GMCR provides the Montreal CBU with a massive competitive advantage in terms of brand recognition and authenticity, as well as numerous business synergies. “Our K-Cup pack volumes have been growing in the double-digits for years,” he points out. A fully-automated SmartSeries turntable stretchwrapping systems from Wulftec/M.J. 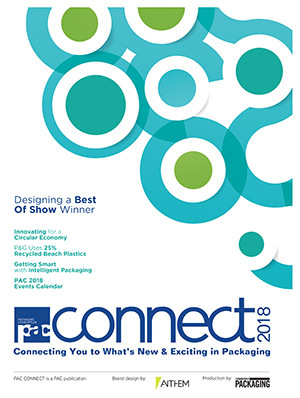 Maillis spring into action to wrap up a towering stack of two palletized product loads made up of seven layers of corrugated shipping carriers, manufactured by Norampac, boasting impeccably positioned product identification labels attached by a Domino M200 series printer-applicator. 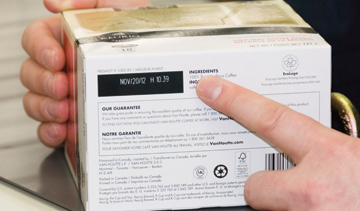 Offered in about 200 different SKUs, the K-Cup packs produced at the Montreal plant now have about half of all of the plant’s packaging lines dedicated exclusively to their production—all periodically with all these lines continuously upgraded to achieve higher processing speeds, according to Vallée, without compromising the plant’s stringent quality standards. Having the plant’s many packaging lines and all the end-of-line packaging operations equipment work in perfect tandem requires a lot of sophisticated software and IT (information technology) engineering, which the Montreal facility has executed brilliantly by standardizing all the equipment on Rockwell Automation’s Allen-Bradley manufacturing systems platform. All the gathered manufacturing data is linked directly into the company-wide ERP (enterprise resource planning) PrM system to manage material, production and schedules planning, production monitoring and control, production and machine downtime analysis, demand planning, data entry and control, generating BOMs (bills-of-material), inventory control and shrink evaluation, and all other key shop floor-related functions in real time. 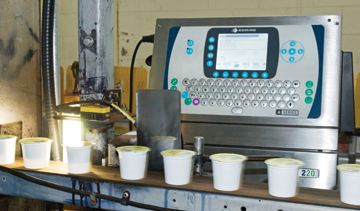 With data integrity being a paramount must-have requirement for the whole operation to run like clockwork, the high-performance product coding/marking and identification systems supplied to the plant over the last few years by Domino Canada, Oakville, Ont.-based subsidiary of the U.K.-based auto ID and digital printing systems manufacturer Domino Printing Sciences plc, play a key role in fulfilling the plant’s vast product identification and traceability requirements. Boasting system installations on all K-Cup pack lines as well as in the plant’s secondary and end-of-line packaging operations downstream, the Domino product coding systems—featuring both inkjet and laser-based technologies—have rightfully earned their stripes as the plant’s product ID systems of choice the old-fashioned way by ensuring excellent print quality, ease-of-operation, seamless integration with the plant’s operating software systems, and superior customer service enabled by Domino’s near presence at a fully-staffed branch office in St-Laurent. 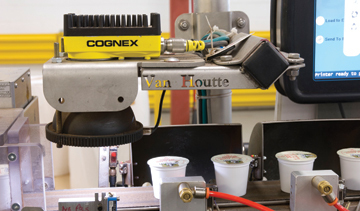 A close-up view of the inner workings of an OPEM filling machine used for K-Cup pack production, featuring Cognex machine vision cameras installed by the plant’s engineers to verify the exact placement and precise positioning of the foil lids, manufactured by Winpak, by displaying and storing an image of every passing lidded container on the user-friendly HMI (human-machine interface) terminal in real time. Says Vallée: “We use Domino for all our product coding needs, from date-coding and barcoding the K-Cup packs with small-character inkjet and laser units to printing and applying barcoded labels onto finished shipping cases with a Domino label printer-applicator, and we never had a major downtime problem with any Domino equipment that either we could not remedy ourselves or that could be quickly fixed by Domino technicians. “Line downtime is the biggest enemy for an operation like ours: We just can’t afford to have a multimillion-dollar equipment line sitting idle because of a technical glitch in a coding machine,” Vallée points out. “Domino staff understands this perfectly and they are available to us at all times to make sure this does not happen. “Their systems are also easy for us to operate for our staff, who really like working with them,” says Vallée, adding that the plant is in the process of purchasing six additional new Domino small-character coders to be installed onto the new incoming Keurig K-Cup pack lines. Two D-Series lasers for permanent product coding across a broad range of surfaces, including the K-Cup packs, to complement the older-version S200+ and two S100 laser-based coders installed between 2007 and 2009. 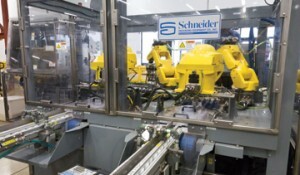 One of six fully-automated palletizing and case-packing workcells supplied by Schneider Packaging houses two model M-170 palletizing robotic arms and two model LP Mate packaging robots from FANUC Robotics to ensure safe high-speed end-of-line packaging at operations at the Montreal plant. A SmartSeries stretchwrapping machine manufactured by Wulftec/M.J. 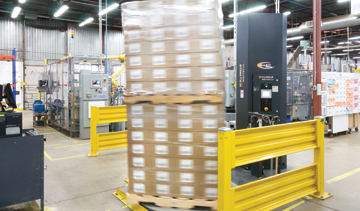 Maillis to secure finished palletized loads for storage and/or transport to customer, outfitted with a Domino print-and-apply system incorporating a ruggedly-designed SATO printhead. All in all, Vallée says he is very pleased with the way all the new packaging equipment has boosted the plant’s productivity levels closer to “worldclass” manufacturing standards, adding that the addition of two new K-Cup pack lines later this year will put the operation even nearer to that coveted performance threshold. One of the plant’s three high-capacity coffee roasters is powered by a series of heavy-duty motors supplied by SEW-Eurodrive.